It’s been a long time since we had a good Spider-Man movie, 13 long years in fact. Since Spider-Man 2 back in 2004, a masterpiece of the superhero genre that still stands up as one of the best of all time, we’ve had several attempts to keep the web-slinger going. Spider-Man 3 was a complete mess, overloaded with villains and led by a far-too-old Tobey Maguire, not to mention the horrific emo dance sequence, while the Amazing Spider-Man pair of films tried too hard to update the series for “modern sensibilities” (whatever that means) and the results were uninspired and extremely dull. I’d come to believe that as long as Sony still held the rights to the wall-crawler, one of my favorite comic book heroes, we’d be doomed to mediocre reboot after mediocre reboot, never again having a Spider-Man movie worthy of the name. So imagine my surprise when a deal was reached between Sony and Marvel/Disney and Spider-Man wound up being one of the best parts of Captain America: Civil War. And now here we are, with Tom Holland’s first full outing in the famous red and blue spider suit, and the results are pretty impressive. Spider-Man: Homecoming is naturally the best Spider-Man movie in 13 years, although that’s really not saying much. It’s a lot of fun, one of the funniest movies in the Marvel Cinematic Universe, and it gets a lot of things right. It’s not perhaps the home run one might be hoping for, but it’s solidly in the top half of MCU films, getting a lot about the character of Peter Parker right, while managing to tie in cleverly with the larger universe of films. Oh, and Tony Stark is in it, getting a little redemption after his last outing in Civil War. Tom Holland continues to prove himself worth both to carry the mantle of the Friendly Neighborhood Spider-Man, but also to be a part of the larger MCU. It’s refreshing to have a Peter Parker in high school who actually looks and acts like a high schooler. Holland’s Parker is a dork, but because Homecoming mercifully isn’t an origin movie we get to see some internal conflict in Peter that’s more than simply struggling with Uncle Ben’s death or trying to master his powers. This time around, Spider-Man has already proven himself in battle with/against the Avengers, and now he’s looking for more meaning in his life than the usual high school trappings and stopping bicycle thieves. Thankfully Tony Stark has left him with a beefed-up suit to help him in his adventures, but the Peter Parker in Homecoming is a superhero in search of an identity and a purpose. He’s gotten a taste of the big time, and the small potatoes in his neighborhood in Queens just isn’t cutting it. Luckily for him there’s trouble brewing thanks to an illicit trade in enhanced weaponry crafted from the leftovers and collateral damage of the Avengers’ many battles, with a connection to the mysterious Vulture. It’s a clever bit of casting having Michael Keaton play the famous villain (though not quite as clever as casting Keaton in Birdman), not to mention Keaton’s immense skill as an actor, and he manages to make a lot more out of the role than exists on the page. He’s a significant improvement over the villains in some of the recent Marvel solo outings (Ant-Man and Doctor Strange, for instance), with a compelling, if basic, motivation, interesting design, and superior acting, but it’s nothing revolutionary. Vulture is no Mandarin, Ultron, or Loki. I can’t overstate how much Homecoming succeeds thanks to its MCU connections. Being a part of a larger endeavor frees Homecoming from having to be an origin story, from having to do much world-building, and it lends context and weight from 15 or so previous movies. Being part of the MCU means having a certain tone, and Homecoming takes that tone and runs with it, giving us one of the funniest and most character driven films in the franchise. This new Spider-Man movie is the first that really feels like a “high school” flick, treating the emotions and turmoil of that period of life with sincerity and meaning, rather than just as window dressing to a superhero movie. 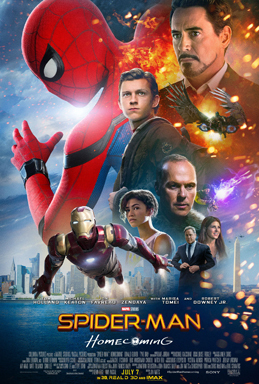 Thankfully it has a wonderful supporting cast to bring the humanity to the movie, including Marisa Tomei as caring Aunt May, Jacob Batalon as Peter’s geeky and excitable best friend Ned, and Zendaya as snarky classmate Michelle. Peter is very much a teenager this time around, with his adolescent struggles magnified by his powers and his situation. He can be completely clueless and charming, but also pig-headed and stubborn, but the earnestness Tom Holland brings to the character is Homecoming‘s biggest strength. But in a similar way to how Tony Stark is reluctant to take off Peter Parker’s training wheels, the powers that be seem a bit reluctant to set Homecoming free. The MCU is a gift to this version of Spider-Man, but it’s also a bit of a crutch, as though the producers were worried that people wouldn’t accept the film without hammering home the connections. Tony Stark is the ultimate double-edged sword. Robert Downey Jr., who by now can surely play Stark in his sleep, knocks every scene out of the park, bringing both the laughs and the emotion of a man who genuinely cares about the kid he’s taken under his wing. But Stark also on occasion holds the film back just as he holds Parker back, popping up to remind us that we’re watching “more” than just a simple Spider-Man movie. Still, Homecoming is a great film and a somewhat surprising achievement. Its success will undoubtedly lead to other exiled Marvel properties partnering with the larger MCU following skillful negotiations with Disney. And while Homecoming may not be all that I might have hoped, it’s so well crafted that I’m eager for more. Tom Holland is perfectly matched with this particular interpretation of Peter Parker, and I can’t wait to see what’s coming down the line. We know we’ll see more of him in Avengers: Infinity War, and it’s been announced that we’ll get another solo outing in a couple years. There’s so much potential with this cast and this particular take on Spidey. It’s not the stylized, unique take of the original Spider-Man trilogy, but it’s mercifully not the plodding, uncreative Amazing films. This new Spider-Man is very much doing the typical Marvel thing, not a revolution but just a solid, wonderfully crafted superhero movie, another notch in the belt of a studio that continues to crank out the hits. Spider-Man is once again in very good hands. This entry was posted in Movie Reviews and tagged Disney, Film Review, Marvel, MCU, movie review, peter parker, Review, Spider-Man, spider-man: homecoming, tom holland, Tony Stark by lovepirate77. Bookmark the permalink. Great review. Pretty much captured some of my feelings regarding the movie sometimes word for word, especially since I felt this movie easily passed Ant-Man and Doctor Strange in my book though once again proving that Marvel can handle single hero go-arounds if they really try. Homecoming easily passed The Amazing SpiderMan movies in my book but likewise I can’t see it surpassing SpiderMan 2 anytime soon, though Tom Holland is easily the best Peter Parker from any movie. I think what didn’t help was the subtle reminders to the Raimi movies from things like the shot of Peter trying to hold the ferry together like Peter stopping the train in SM2 or like Peter lifting the beams like he did at the end of SM2 (or the fact that Raimi wanted to use the Vulture as a villain before he left SpiderMan 4). Those scenes were visually good in Homecoming, but they fall a little short when they remind me of something spectacular like they did in SM2. On the other hand, I think this series probably has some of the more interesting characters to develop. The Raimi trilogy had clear character archetypes, but I enjoy the potential these new ones have as well. Nevertheless, I have to wonder whether the Vulture would have been half as successful if it wasn’t for Michael Keaton alone. He gives this intimidating factor even while seeming friendly which was essential for this role. It’s not necessarily an insult since it proves Marvel’s success in casting, though the SM movies have always had the more outrageous and more visually interesting villains. I almost wonder if one of the problems with the pathos came from the streamlining of the origin story. Don’t get me wrong, I was glad we didn’t get a rehash of Uncle Ben’s death for the third time in 15 years, but I found it hard to believe that Tom Holland’s character went through the death of a father figure caused by his own actions or considers the mantra “with great power comes great responsibility.” He’s not necessarily opposed to that since he has a huge desire to help others and worries for his Aunt May after “everything that has happened,” but not a single mention of Uncle Ben eliminates some of the nobility of the SpiderMan character in my opinion. I’m still optimistic though since introducing characters and their universe is enough of a challenge without trying to balance a steady theme and pathos. Since SM sequels usually go bigger and bolder (for both good and bad angles), there will likely be another more intense chance to examine this new Peter’s character as he is tested to his limits. Sometimes that can offer a chance to really know him. BTW I loved that moment you’re probably talking about too. Sent me right back to 2008 and almost made up for everything. Great write up and as is so often the case we agree on almost everything, especially the other Spider-Man films (see my post ranking them). I’ve missed your regular reviews. Glad to hear it’s a great film!